USD$69.00 with free shipping worldwide, available online from Wingnut Wings' website. 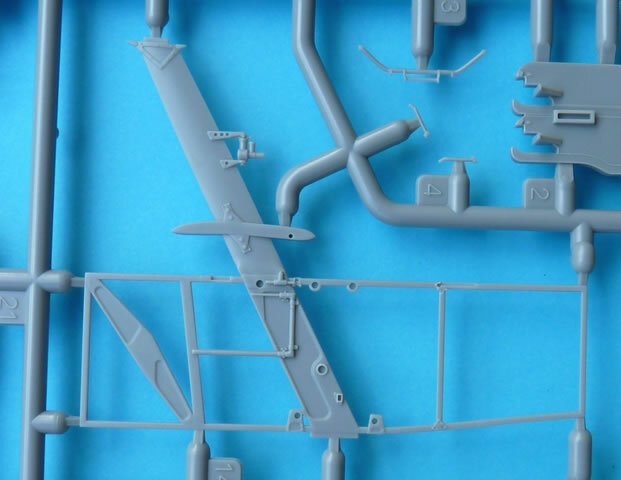 Excellent detail; flawless mouldings; clever engineering; photo-etched parts; educational instruction booklet; comprehensive decal sheet that includes logos and stencil data. Another quality package from Wingnut Wings. 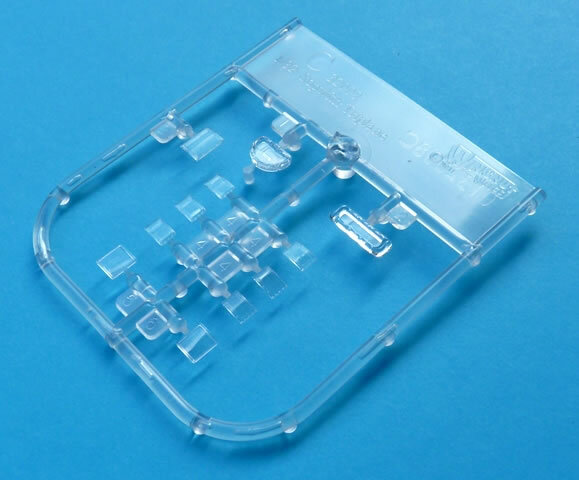 Just like all their other kits, it has been designed for ease of assembly without compromising detail. 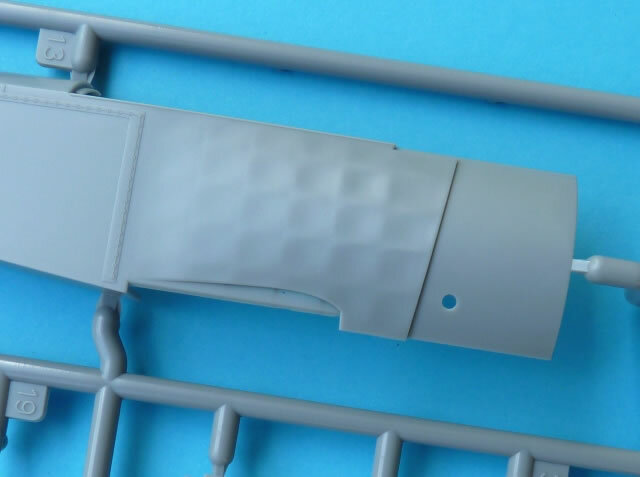 The standard of this detail is remarkable, as is the level of research, which allows the modeller to build an exacting replica straight from the box. The onslaught continues with yet another welcome release from the Land of the Long White Cloud. 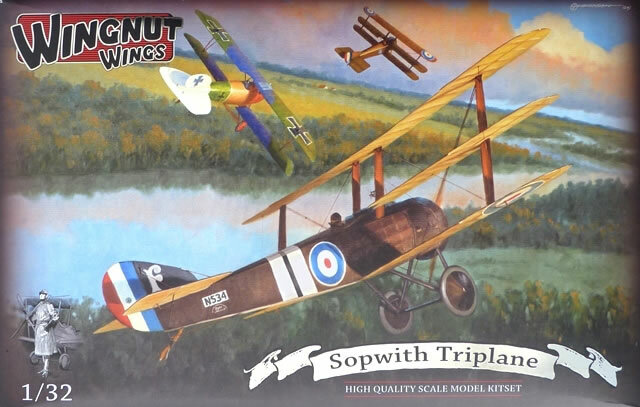 This time it’s the Sopwith Triplane, a design that took over from the “Pup”. It had a remarkable rate of climb, good visibility, and excellent manoeuvrability. In fact the performance so impressed the Germans that they spent a lot of time and money to come up with a “Tripe” of their own. 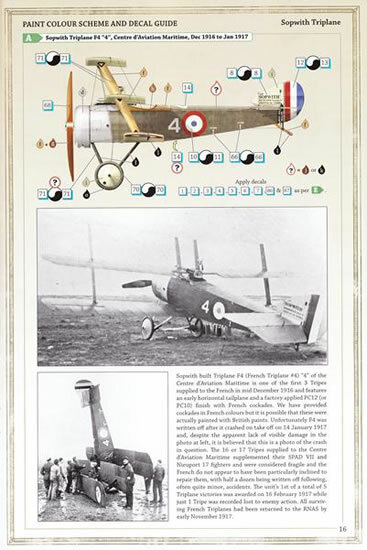 Although the design was ordered into production by both the RFC and RNAS, it was only the latter that flew it operationally in France. They performed admirably and notched up quite a few victories. Those successes did come at a cost however, with over 50 being lost to enemy action. With the arrival of the twin gunned Camel, the Tripehound’s days were numbered. Only about 150 were produced but despite their small number, they have left an indelible mark in the history of WWI aviation. 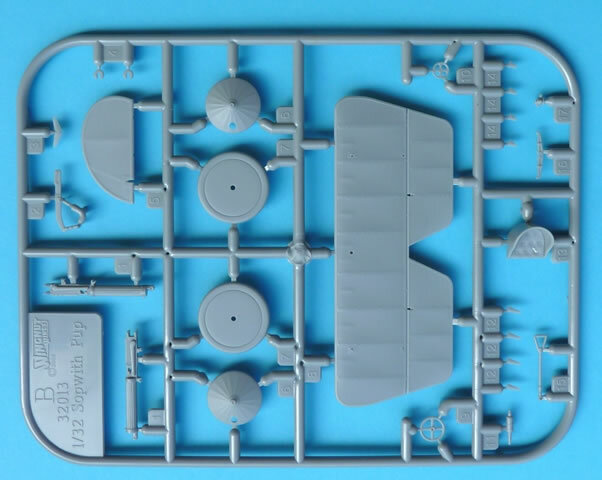 Inside the box are 6 sprues of plastic, a fret of photo-etched parts, and decal options for 5 aircraft. The usual comprehensive instruction booklet is included which doubles as a very handy piece of reference material. 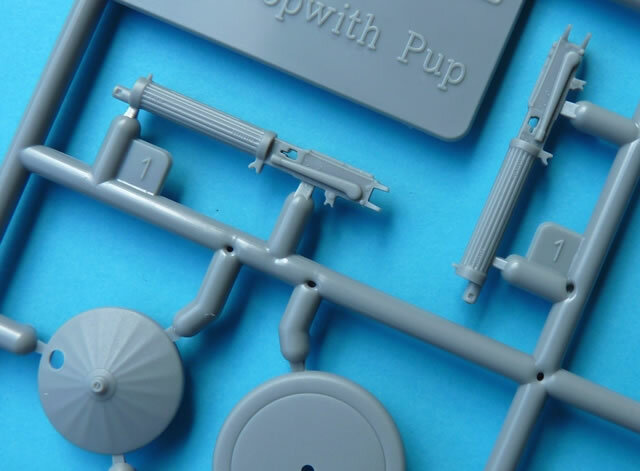 All of the parts are superbly moulded with no sinks marks or other blemishes contaminating my example. 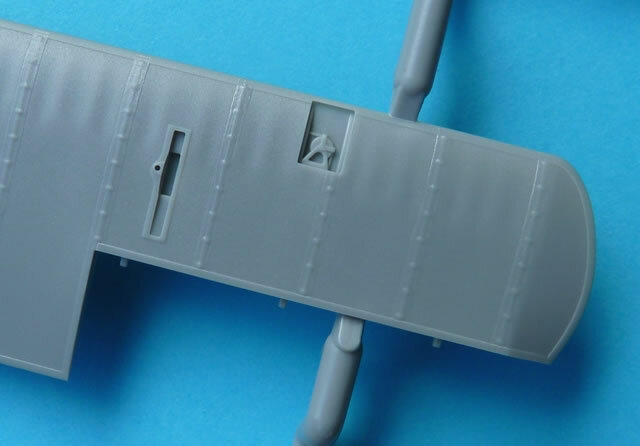 The necessary ejection pins have been cleverly located to areas that will not be visible on the finished model, and sprue attachment points have been kept to a minimum. 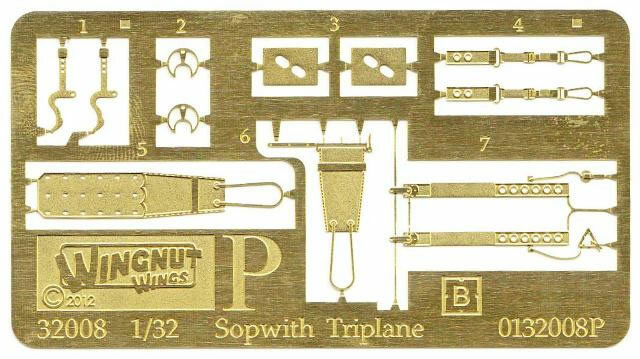 Wingnut Wings are renowned for the intelligent way in which they engineer their products and this kit is no exception. The cockpit is made up of 22 parts, the largest being the interior structure that incorporates the single piece central struts. This allows perfect alignment of the middle wing in relation to the fuselage and also results in a sturdy configuration. 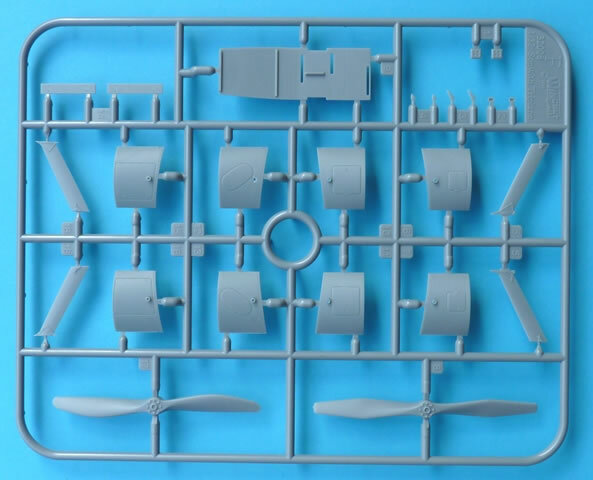 Other items include the obligatory floor, control column, rudder bar, seat (with p-e belts), tailplane adjusting wheel, and pressure pump for the fuel tank. 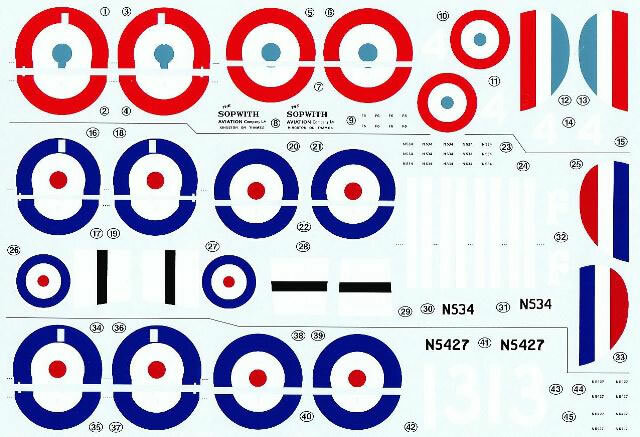 There is also the option for single or twin machine gun arrangements, and as such we get a choice of cut-outs for the instrument panel, alternate gun mounts and single or dual feed ammunition cans. In this scale, legible instrument faces are compulsory and these come courtesy of a well-appointed decal sheet. Make sure that any extraneous carrier film is removed so that the item fits within its designated location. 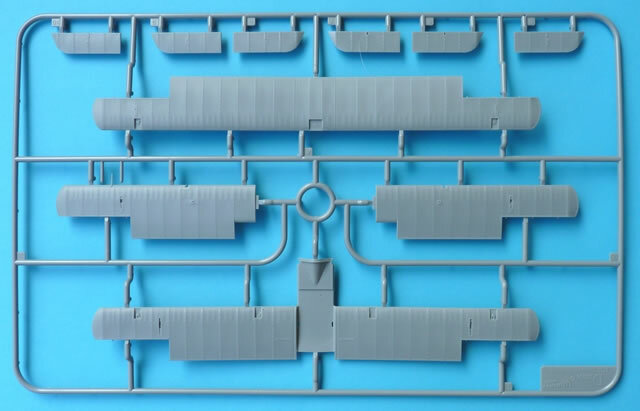 An interior rigging guide helps the modeller add the bracing and control cables and a dry fit of the interior components reveals that everything fits perfectly. The flying surfaces are up to the usual high standards we have come to expect from this manufacturer. The top and lower wings are single span items with no distortion whatsoever. Each displays a delicate representation of the stitching below the rib tapes and the trailing edges are commendably thin. 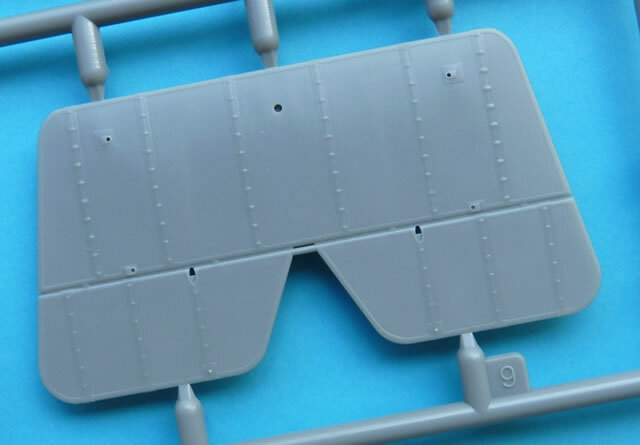 Testimony to the completeness of the kit is the provision for different shaped access panels behind the cowling. Three types are catered for so if you haven’t made a decision as to which option you are building…now is the time. Also supplied is a choice between early and late style tailplanes. The representation of the various inspection windows is also well done. 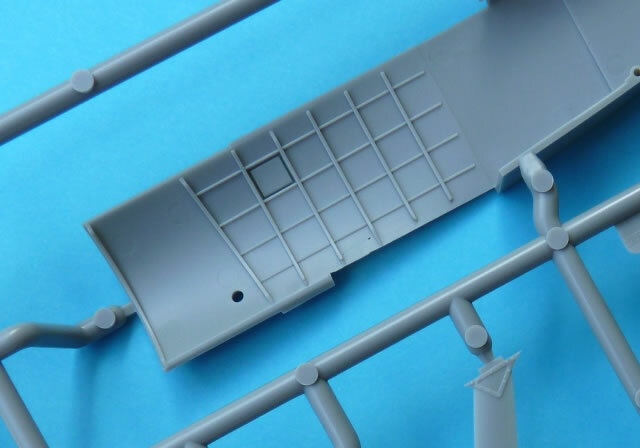 Both anti-drag wire attachment points, and pulley detail, are moulded as part of each wing where appropriate. To this one adds a clear plastic cover to complete the effect. As usual, fabric surface textures are subtle and realistic. Particularly impressive is the dimpling of the fabric on the outside of the fuselage in the cockpit area. 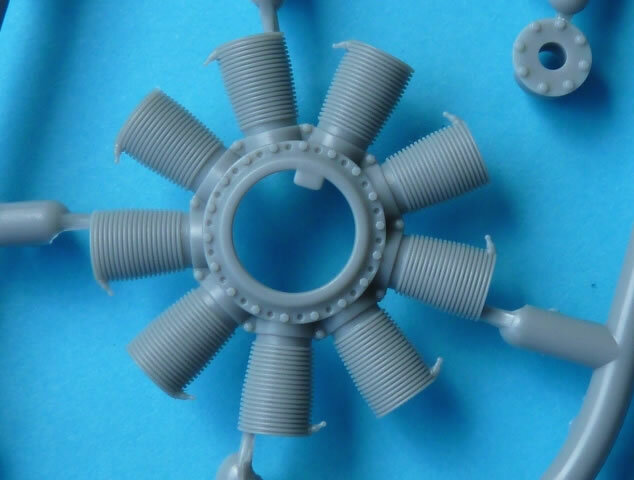 A single sprue caters for the Clerget 110hp 9z and 130hp 9b rotary engines. The cylinder detail is exquisite with the two halves coming together perfectly. The join is a breeze to clean-up and it all fits behind a wonderful one-piece slotted cowling. 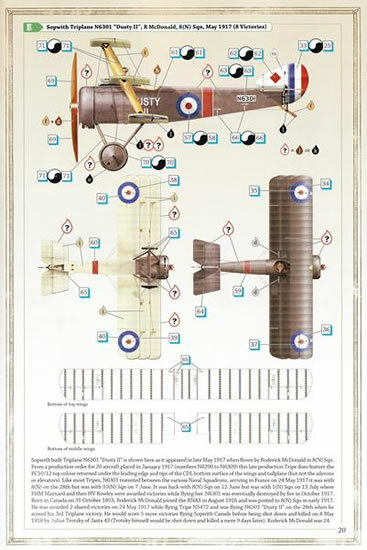 There are five aircraft to choose from on the A4 sized decal sheet. Cartograf are responsible for the printing and as expected there were no registration problems at all. Carrier film is kept to a minimum around each item, which includes the all-important stencil data amongst the national and personal markings. Over a dozen were delivered to the French and this was one of the first 3 to arrive in December 1916. A month later it crashed and was written off. 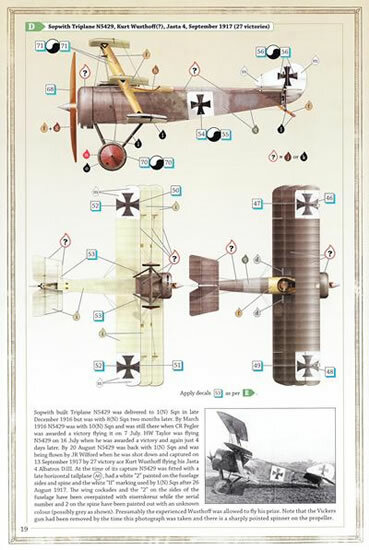 The Unit scored 5 victories using the Triplane with only 1 being lost to enemy action. N5427 was another mount of Forester Herbert Martin “Sammy” Maynard. He was born in New Zealand on 1 May 1893, joined the Navy in 1914, and transferred to the RNAS in 1915. All 6 of his victories were in the triplane. He lived to the ripe old age of 82 before passing away on 26 January 1976. This aircraft was with 1(N) Sqn before succumbing to 27 victory ace Kurt Wusthoff. The unlucky pilot was JR Wilford who tangled with the Albatros D.III’s of Jasta 4 on 13 September 1917. Before being overpainted by the Germans, N5429 wore a white 2 on the fuselage and spine, and the 1(N) Sqn’s white “II” marking. 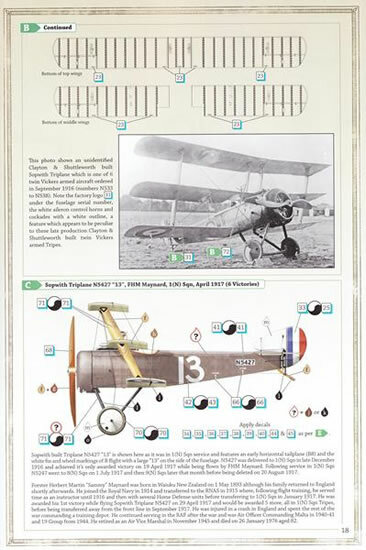 This late production triplane is shown as flown by Roderick McDonald although a couple of other airmen are also known to have scored victories in it. N6301 was later with 1(N) Sqn in June when both FHM Maynard and HV Rowley used it to add to their lists of conquests. It is clear that the company’s reputation for quality continues unabated. The attention to detail is obvious throughout and the engineering of the kit allows even the most inexperienced WWI modeller to build an outstanding replica. In fact, despite the three wings, this is one of the easiest WNW kits to assemble. 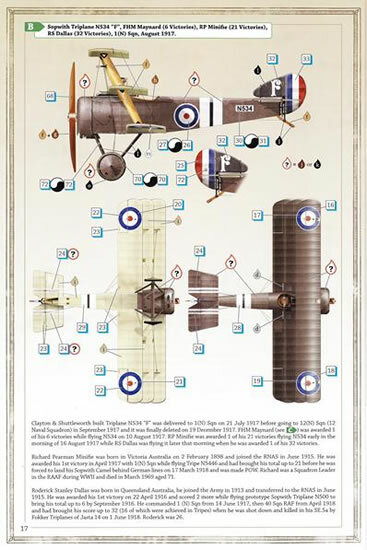 As such it’s another worthy addition to their ever increasing range of 1:32 scale WWI aircraft.